Order your own copy of Shadowlands at your local retailer or online through our website today! South of Rokugan, the foul Shadowlands fester, providing a home to horrid demons and unnatural creatures. Centuries ago, the Crab Clan built the mighty Kaiu Wall to contain these threats, but each day sees new assaults. Without samurai of courage and honor to defend against the threats of the Shadowlands, the Emerald Empire would surely fall. Protecting Rokugan from the threats of the Shadowlands is an honorable and vital task. But many samurai who join the cause never find their way home. In the domain of Fu Leng, where the very elements are corrupted and hideous monsters lurk around every corner, do your players have what it takes to survive? 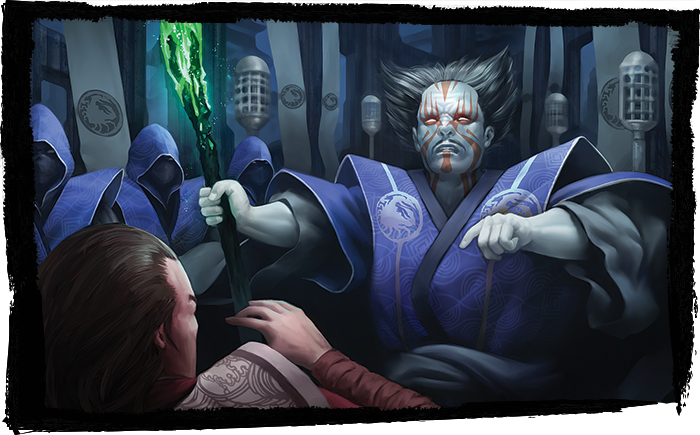 Fantasy Flight Games is proud to announce Shadowlands, a new sourcebook for Legend of the Five Rings Roleplaying! Like Emerald Empire before it, Shadowlands provides everything you need to roleplay in Rokugan in a whole new way, tinged with elements of horror and despair that can be found nowhere else in the Emerald Empire! As a special bonus for pre-ordering Shadowlands through our website, you’ll also a receive a bookmark and eight 5" x 7" art prints showcasing art from the book. This bookmark is the perfect way to mark important sections of the sourcebook such as charts or NPC information. 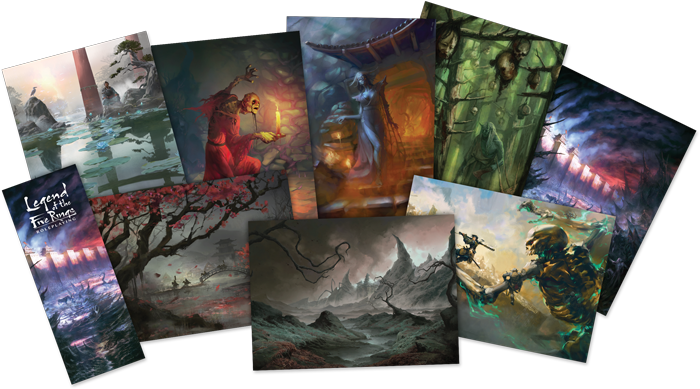 Meanwhile, the art prints represent beautiful moments and characters found within the Shadowlands sourcebook! 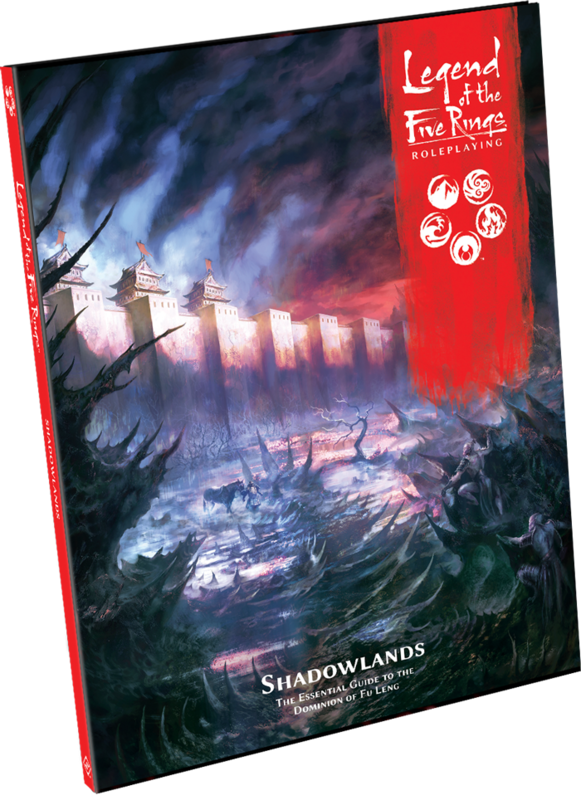 The Shadowlands sourcebook is split into three chapters, the first of which explores various locations across the corrupted lands, from the Festering Pit of Fu Leng to Daylight Castle. The book not only features detailed histories of these locations, but also introduces their corrupted denizens to use as NPCs in your adventures! Like Emerald Empire before it, each of these locations will also feature adventure seeds for Game Masters to introduce to their players, potentially leading them to the next step on their journey. Furthermore, rumors about each of these areas brings the Shadowlands to life, and can inspire Game Masters to craft their own adventures in the dread lands. Perhaps your players are investigating the Fallen Chrysanthemum Lake, and the strange disappearances that always seem to happen in its proximity. Or maybe your party has traveled to the False Lantern Grove to retrieve the remains of a Hida commander whose party fell to the darkness of the realm. Either way, Shadowlands gives you all the tools you need to craft a thrilling adventure. This chapter also details the stalwart defenders repulsing these forces from Rokugan: the Crab Clan. While the families of the Crab are detailed in the Core Rulebook, Shadowlands greatly expands on this information, detailing important locations, NPCs, and adventure hooks for each family. The Hida, Kaiu, Kuni, Yasuki, and Hiruma are all expanded upon, inviting Game Masters to integrate the families' unique history into campaign, or allowing players to expand on their family history. Finally, the first chapter details the convergence point of these two forces, the massive Kaiu Wall and the brave patrols that explore and investigate the Shadowlands. Here, you can discover what it truly means to patrol in the Shadowlands, with devious NPCs and adventure hooks waiting around every corner. The second chapter introduces the ghost-hunting Falcon Clan, including rules for creating player characters from the clan. It also includes other new player options, including schools, weapons, armor, and techniques, plus patterns to create customized items to better protect the Empire. There are new advantages and disadvantages relating to the Shadowlands and, for those who dare, there is guidance for using mahō and new techniques for employing such dread blood magic. 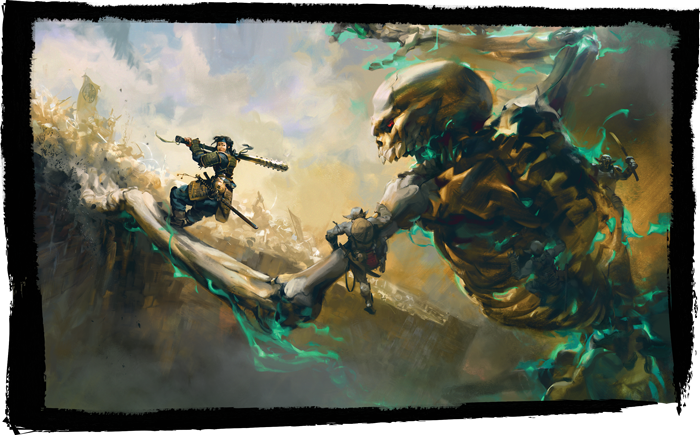 These player options introduce even more new ways to interact with Legend of the Five Rings Roleplaying, and let you inject your characters with some more Shadowlands-related backstory. In the final chapter of Shadowlands, you'll find important tips to the Game Master in regards to running campaigns in the Shadowlands. This chapter not only details how to convey the horror themes central to the setting, but also includes advice for roleplaying corruption, new ways to spend opportunity in the Shadowlands, and additional NPC templates for creating characters themed for Crab and Shadowlands adventures. 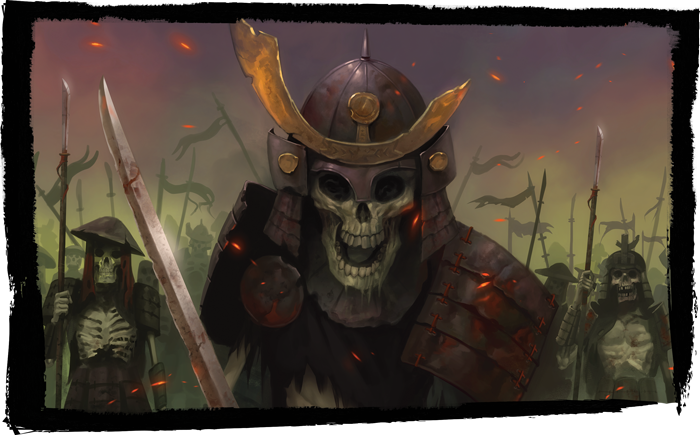 Lastly, there are rules for crafting unique new oni to terrorize and devour the Empire—unless there are samurai courageous enough to stop them. For some additional inspiration, be sure to check out the Mask of the Oni adventure launching alongside Shadowlands. This adventure plunges your players into the heart of Daylight Castle, and it's the perfect starting point to discover the horrors that lurk in these areas where few dare to venture! While running adventures in the Shadowland is alluring, be warned—samurai that venture south of the Kaiu Wall are never quite the same. It is a forsaken land where corruption and madness reign. Do your players have what it takes to venture into Fu Leng’s domain with their body, sanity, and soul intact? 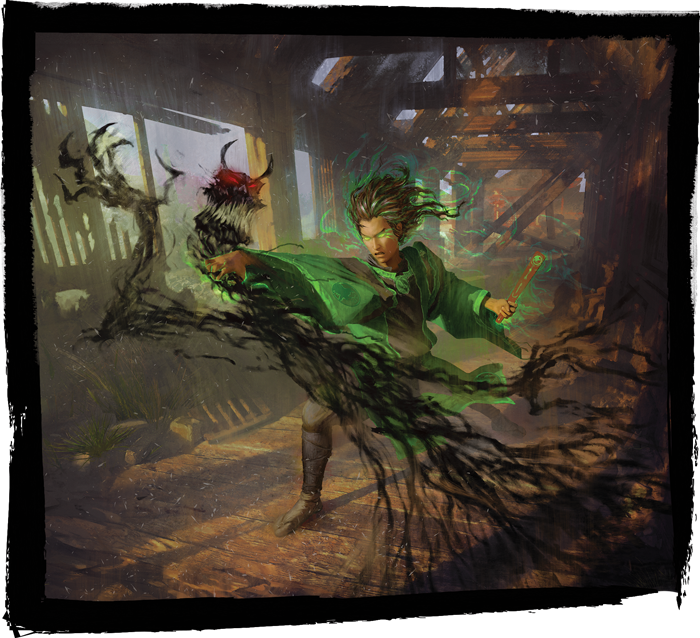 Discover the realm of Fu Leng in Shadowlands (L5R06), a new sourcebook for Legend of the Five Rings Roleplaying, available now for pre-order from your local retailer or our website!